Can you tell that I’m trying to convince myself, through food, that it’s not still 90+ degrees outside? Because, you know…we don’t generally eat hot soup when it’s 90 degrees so it must be fall. Right? Keep dreamin’ sista. Maybe by the time November rolls around we’ll be seeing more fall-like temps. But for now, I’ll just go ahead and eat like it’s already arrived. Fake it ’til ya make it, as the saying goes.Gumbo was actually J’s idea. He is not a seasonal eater. He likes what he likes, and he wants the food he wants. Doesn’t matter if it’s 103 or 33 outside. And that’s just fine with me! As long as I can get the ingredients, I’ll happily make the man whatever he wants. Well, maybe not anything. Boiled cabbage…not happenin’. J actually went to the grocery store to pick up the okra, and a few other items I needed for the week, only to find that they were out of fresh okra. Because of course they were. Thankfully he’s so sweet that he had them call another location to see if they had any in stock, and they did! So, he drove to the other location to get it (and the other stuff, too.) All that to save me from having to stop at the store after work – isn’t he a doll? Well, a manly, studly doll, of course. My Cajun friends may disown me after this next statement, but I can’t recall ever having eaten gumbo before. 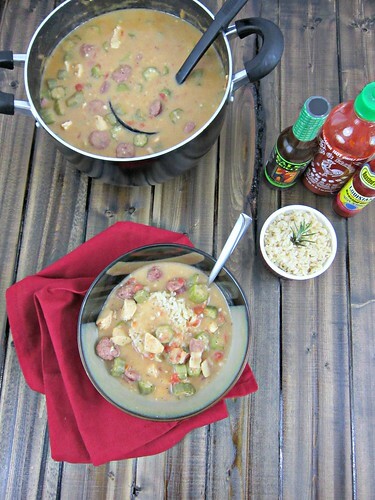 I made a Gumbo-laya awhile back that was a simplified version of a gumbo and Jambalaya combo, but that wasn’t the “real deal” by any stretch. When I looked at recipes and saw the emphasis about the roux and cooking it until it was dark, etc. I decided that’s not the route I wanted to go for my first try. This time, however, I decided I’d try to do it at least a little authentic. Maybe not hours-long-roux-making authentic, but there is a roux. That counts, right?? All joking aside, I was very pleased with how it turned out. I made a few changes to the original recipe (I don’t do green bell peppers…sorry folks) and used venison smoked sausage instead of andouille, and I stirred my little heart out for the roux. I’m not sure I got it quite as dark as it was supposed to be, but my arm – and my patience – gave out after awhile. I had to rely on J’s past experiences to know if it tasted right, since I’d never had it before. I mean, I thought it tasted great – but did it taste how it was supposed to?? According to J, it did. The sauce was slightly thick and full of great flavor and the okra was amazing. As were the chicken of venison, of course. And did I mention…bacon?!?! 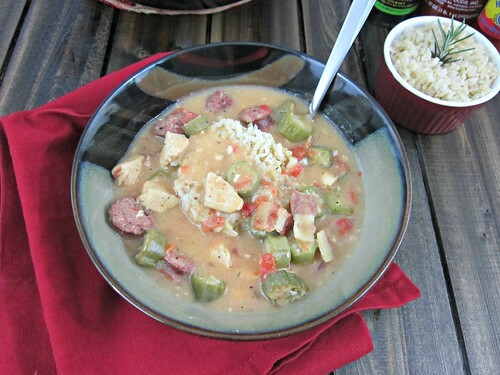 Yep, this gumbo has bacon! I don’t know if it does traditionally, but I wasn’t going to argue it. Because, bacon. But boy is this a filling dish. I mean, full to the gills, filling. And I had it for lunch the following day as well. At 4:15 I was still full. So…take that into consideration when filling up your bowl. It may not look like much, but it’ll sneak up on ya. In a good way of course. It’s so tasty that you won’t want to stop eating it. But you must. Portion control!! And, it makes PLENTY. So, you can share it, eat it for leftovers for fifty bagillion days, or…freeze it! But whatever you decide to do, make it! Heat 1⁄4 cup oil in a large stock pot or Dutch oven over medium-high heat. Season the chicken with salt and pepper, and add to the pot. Cook, stirring occasionally, until lightly browned, then transfer to a plate. Add the sausage and bacon to the pot and cook, stirring, until their fat renders and the bacon is browned, about 5-7 minutes. Remove to the plate with the chicken. Add the remaining oil to the pot and reduce heat to medium-low. Whisk in the flour and cook, stirring constantly, until this mixture is the color of dark, reddish caramel, about 8 minutes. Add the celery salt and onion, and cook until soft, about 6 minutes. Add the thyme, cayenne, tomatoes, garlic, and bay leaf, stir to combine and cook for 3 minutes. Now add the chicken, sausage, and bacon back into the pot, along with okra and chicken stock, and bring to a boil over high heat. Once boiling, reduce the heat to medium and cook, stirring occasionally, until chicken is cooked through, okra is tender, and gumbo is thickened, about 20 minutes. Season with salt and pepper, to taste and serve over rice, with your favorite hot sauce!